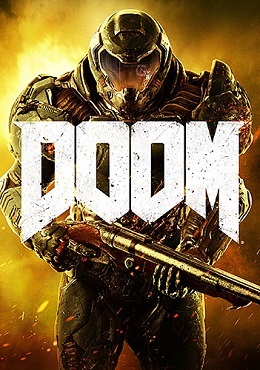 It's a little funny that this is the fourth canonical Doom game, yet the second to bear the simple name of Doom. Doom has been in the works as far back as 2008, though it reportedly was scrapped at least once and remade from scratch. Id also lost one of its principal founders, John Carmack, during Doom's development, along with several other key team members. Another warning sign was that there was a poorly received multiplayer beta, and review copies of the game were not made available until the release date. These types of circumstances often lead to Duke Nukem Forever levels of bad video game, so I was absolutely skeptical of Doom. My skepticism was for nothing. Doom is fantastic. Mars and Hell look pretty good. Believe it or not, Doom has a story, and it's exactly enough story and of an appropriate tone for a Doom game in 2016. 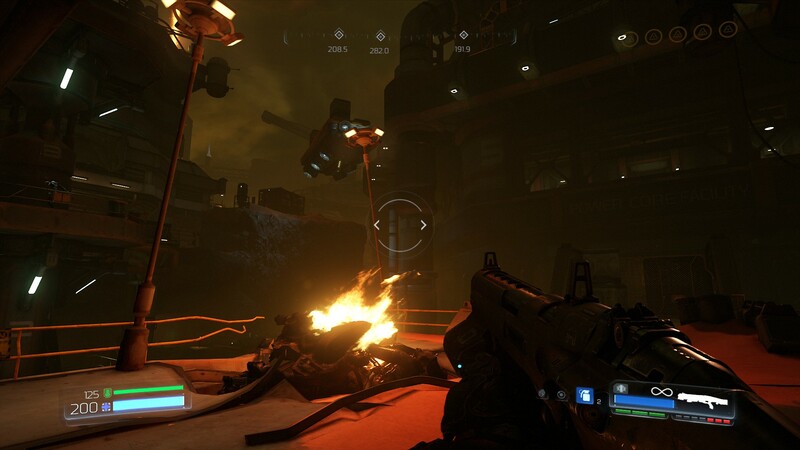 You are Doom Marine (yes, that's one of your names), and you wake up chained to a table in research base on Mars and surrounded by zombie-like monsters. After you bust out of your restraints and kill the demons, you find your armor looking like it's been excavated out of a block of stone. You then learn that Mars is suffering from a demonic invasion and you're the only solution. Kill the forces of Hell and stop the invasion. There's a lot conveyed in the first 10 minutes of Doom that set the pace and tone of the entire game. Doom 3 started with upwards of 30 minutes of tension building and place setting. In Doom, you're immediately surrounded by enemies, handed a pistol, and forced to fight. Before the talking head finishes telling you about the demonic invasion, Doom Marine violently shoves the LCD monitor away, breaking it. Then you fight a handful of demons in an enclosed area where you learn about Glory Kills. Glory Kills let you execute a weakened enemy to regain health. You ten find the shotgun, the talking head tells you that everything leading up to the demonic invasion was for the good of humanity while you look down on a mutilated corpse, and then title screen hits. 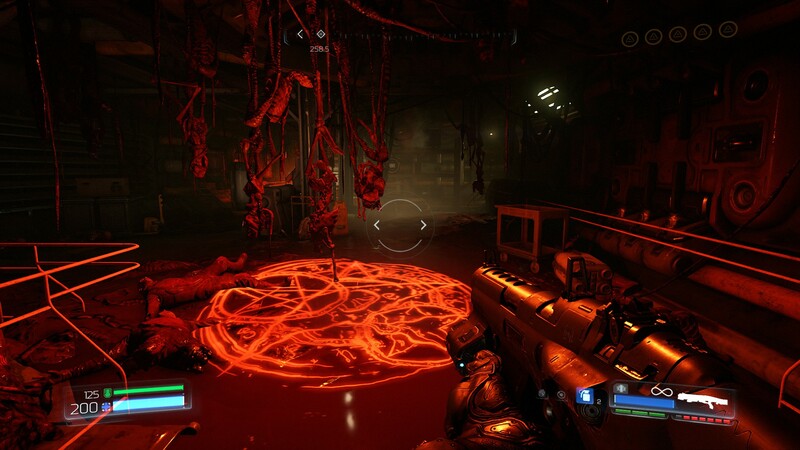 Even in 2016, there is no lack of Satanic imagery in Doom. Like the classic Doom games, Doom is about skilled movement and aggressive action. It is not Call of Duty. Doom Marine can take a lot of punishment and easily dodge around enemy fire. If you're low on health, hiding in a corner will do you no good; there are no regenerating health mechanics. You have to get back in the fight, and violently murder demons with Glory Kills to regain health in combat. Doom also gives a good reason to use the chainsaw in combat. Killing enemies with the chainsaw causes them to pop like a pinata full of ammunition. This is a core gameplay loop of Doom; kill demons to reduce their numbers, Glory Kill them to refill health, chainsaw them to refill ammo. It's a little blurry, but yes, I am punching the jaw off of this imp. It's not perfect, but the problems are fixable. It has bugs. I've experienced more than a couple of crashes to desktop. If you're playing with keyboard and mouse (as you should on PC), you'll find that some of the really good flavor text is unreadable because there's no way to scroll through it. The scroll wheel, which you'd expect to do that, doesn't. It has a multiplayer mode that's fast and fun enough, even if it isn't particularly interesting. 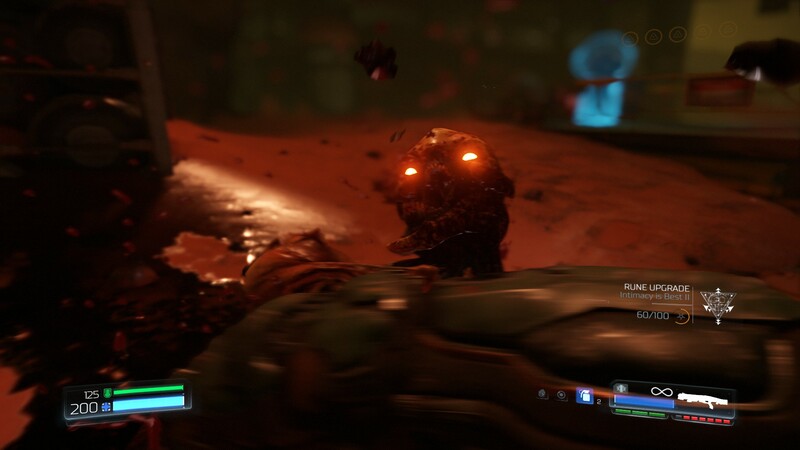 As a single player game though, Doom is incredible. It does what may have seemed impossible; it takes the classic games and gives them a 2016 upgrade. It's undeniably Doom from beginning to end. Where Wolfenstein: The New Order was great for reimagining what Wolfenstein could be in 2014, Doom largely keeps the original's formula and adds some smart modern improvements without harming what made the original games great to begin with.